Trollstigen (English: The Troll Ladder) is a mountain road in Rauma, Norway, part of Norwegian National Road 63 connecting Ã…ndalsnes in Rauma and Valldal in Norddal. It is a popular tourist attraction due to its steep incline of 9% and eleven hairpin bends up a steep mountain side. Oho, appropriate names make me rub my hands together and giggle like a chicken. Oh, to take something fast enough to do something stupid in/on up and back down that piece of road. Four wheels first, then on two. Seems like heaven for FWD Tarmac Rally enthusiasts hehe. Rolling a ball down it 😛 lovely. This stretch of road seems like it could be effective in weeding out drunk and idiotic drivers. I love how an american muscle car is in this picture. Dodge Challenger. 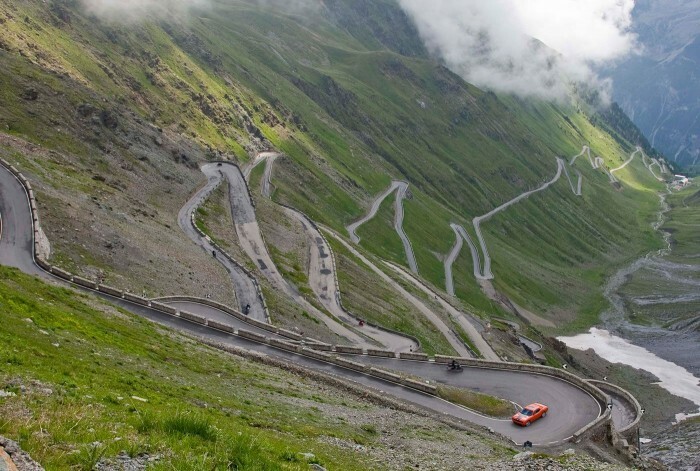 The Trollstigen is impressive, but that there is a picture of the Stelvio Pass in Italy.